The early C12 nave may incorporate a C11 tower-nave, but in that case there are some oddities. The aisles are late C12 and the tower, clerestory, chancel and wall-paintings C13. The porches are C15. Large like other parishes in this area, this was a centre of mediaeval glass-making. The large church stands on a low mound that seems barely wide enough and this appears to have determined a number of unusual features. The rare dedication is shared with one of the chapels in the Tower of London and, though no link is known, both probably originated in the later C11. The nave presents some puzzles. The walls of the roughly square western part are 4ft 6in thick, with herringbone masonry, which was commonest before 1100, small north and south windows and flat clasping buttresses. Stepped round-headed north and south doorways lack abaci and the west one, which is off-centre and has a solid tympanum, could have opened onto a stair. The walling of the eastern part is much thinner, but with herringbone at its south east angle. Godfrey posits a massive, square tower-nave (2 p4), with a chancel on the site of the eastern part. 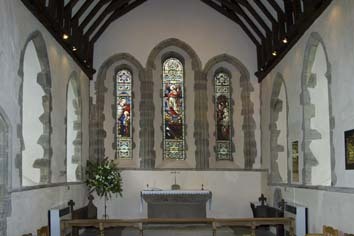 This arrangement exists elsewhere, eg Fingest, Buckinghamshire (BE p380), but the north wall of the western part of the present chancel also has herringbone, suggesting all are of the same date. 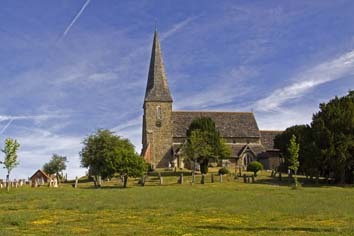 Conceivably there was a two-part chancel and sanctuary like Bishopstone, East Sussex, but no example is known of this arrangement combined with a tower-nave. In the late C12 aisles were added only to the eastern part of the nave as the walls of the western part were presumably too thick to be pierced. Three lancets including the east one remain in the north aisle, but the south one was rebuilt later (see below). The two-bay south arcade has broad, unchamfered heads, a round pier with a square capital and chamfered responds with trefoiled stops and plain abaci. The pier and responds of the north arcade are similar, but the heads are later (see below). 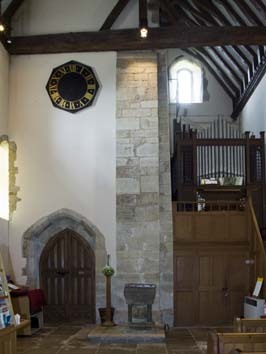 A slightly narrower eastern arch allows room for the entrance to the rood-stair, an arrangement which appears contemporary, as the respond looks unaltered. 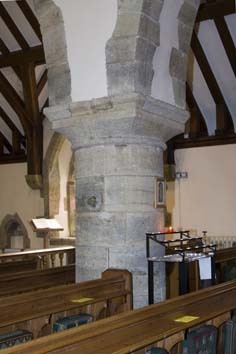 If this is so, this is an early example of a rood-loft. The slightly chamfered chancel arch is similar with broad and relatively low proportions, though the bases of the responds are higher. Despite the presence of earlier masonry in the western part of the chancel, the pointed head is again late C12 at the earliest. 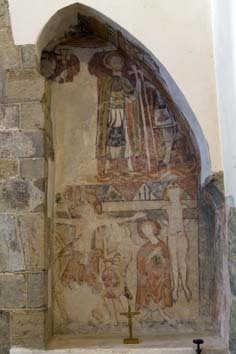 Indeed, the paintings in a plain pointed recess to its south, of a kind used for a nave altar, are dated to 1200 at the earliest (see below), yet the chancel arch cuts into them, suggesting the arch is later still. Godfrey posits a triple arch (2 p6), but these were never common and virtually unheard of by this date. In any case, the recess on which he based his argument was surely never an arch and there is no sign of a matching north one. The sequence of construction is hard to follow, but conceivably the chancel arch was altered with the north arcade in the late C13 (see also below). The floor of the long chancel is a step below the nave, presumably because of the slope of the mound. Except the herringbone outside, there is nothing earlier than the C13. There are three tall lancets each side, the westernmost ones with lower sills, and three stepped east ones; the centre one is wider and taller and the rere-arches are roll-moulded, with a string-course linking the sills. A north doorway has a continuous roll-moulding. In the later C13 a thin tower was inserted awkwardly in the south west angle of the putative tower-nave, partly blocking the south window inside. Presumably there was insufficient room for a west tower in the conventional position, but it is odd, unless there were major structural problems of which there is no sign, that this should have been placed within the C11 west structure, unless this had remained unfinished. 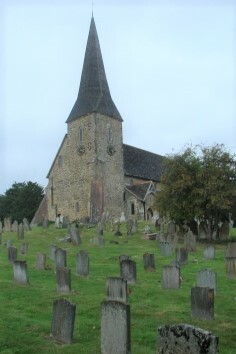 The tower, little higher than the nave, has a tall broach spire, small lancets, including a pair to the north, and a plain pointed doorway instead of a tower arch. The low clerestory, with more plain lancets, including two in the east gable, is probably of the same date. The braced crownposts of the roof, though embellished in the C19, look C13. New heads were placed on the north arcade, with one chamfered and one hollow-chamfered order, growing out of upward extensions of the pier and responds. 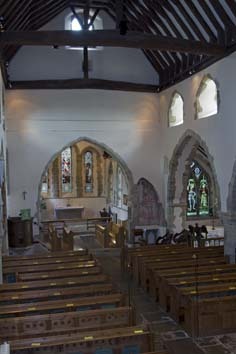 The chancel arch was possibly also altered (see above), though as nothing is obviously of the period, the builders would have had to re-use existing work. By c1300 the church had reached its present dimensions, except for the south aisle, which was rebuilt wider soon after this work at the latest. Its big three-light east window with intersecting tracery and a hollow-chamfered rere-arch look early C14. 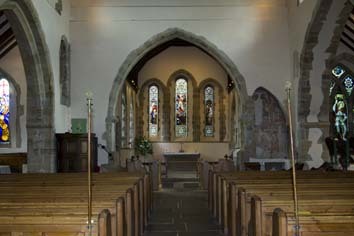 C15 porches were added both sides of the western nave in front of the original doorways. The timber north one, though repaired, has traceried open sides and bargeboards. 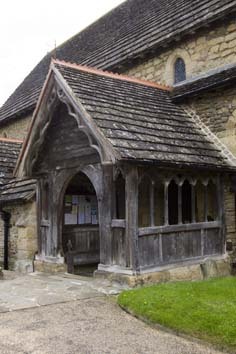 The stone south porch, with a double-chamfered arch and a cinquefoiled west opening, continues the line of the aisle, though structurally distinct. After the Reformation, buttresses were added, suggesting problems with foundations. The Sharpe Collection drawing (1805) shows them at the south east corner of the chancel and against the north aisle (both gone) and as late as 1838 the extant brick west buttresses (2 p8) were built. Adelaide Tracy (II p32) (1849) shows two dormers for a gallery in the south aisle and in 1853 lightning destroyed the upper part of the spire (BN 3 p495). E Christian restored the church in 1867-68 (B 25 (6 April 1867) p ii). Often he worked for the Ecclesiastical Commissioners only on the chancels that were their responsibility, but the accounts for the restoration (WSRO Par 210/9/3) confirm that he did everything. An attribution to W Butterfield (Jessup p269, repeated in EH and BE p 380) was questioned on stylistic grounds by Paul Thompson (p452) and in the light of the above may be discounted. Christian replaced the roofs except in the nave, to which he added castellated wallplates. He retained the Horsham slab roofs, some of the finest in Sussex, and added gabled windows in both aisles; the south one was largely refaced. Altar: (East end of south aisle) W H R Blacking, 1937 (CDG Oct 1937 p353). Only the rails are in any way remarkable. Benches: (North aisle east, south aisle west and north porch) Probably C16 with fleur-de-lis finials. That in the south aisle bears the names of the farms which had been allocated seats on that particular bench, probably in the C18. Font: C13 with a square bowl. 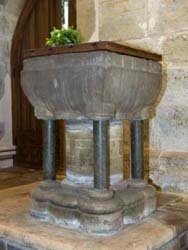 The underside curves inwards and the capitals of the shafts on which it stands are carved into it, with a thicker central stem. The bowl is of local limestone, but the shafts are marble, possibly renewed. 1. (South west aisle lancet) Assemblage of fragments of mediaeval glass, found on the sites of glass furnaces in the parish. 2. 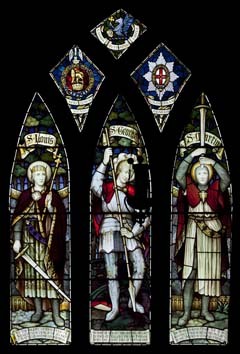 (East window of three lancets) H Hughes, 1877 (signed). 3. (South aisle, east window) A L Moore, c1917 (signed). 5. 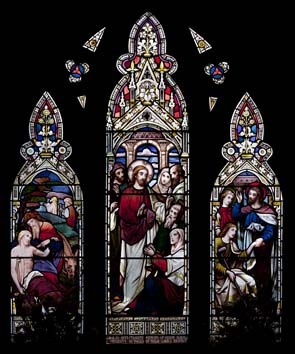 (North aisle, east window) C Durant, 2008 (ibid). Monument: (South aisle, west wall) Henry Napper (1803?) by G Page (Roscoe p932). Draped urn. 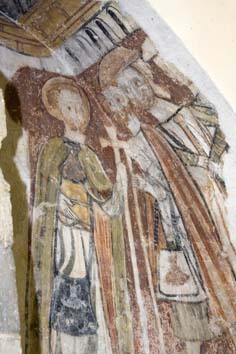 Paintings: (Recess in east nave wall) Dated to c1200-50 and arranged in two tiers, all set within a depiction of a church. 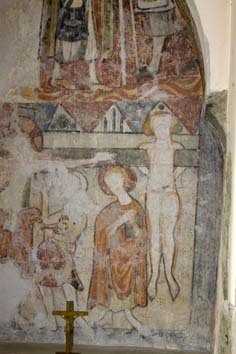 This is only one instance of the unusual iconography found here which, in Anne Marshall’s view (www.paintedchurch.org retrieved on 29/4/2013) should make the paintings better known than they are. The lower tier has a Crucifixion in which, unusually, Christ is shown with a crown, possibly to indicate that he is the King of Glory and in addition one of the thieves, probably the penitent one, is depicted hanging from the cross-piece of Christ’s own cross (ibid). The upper one shows a saint leading pilgrims, identified as St James with pilgrims on the way to Compostella as early as 1870 (3 p126), on account of the saint’s attribute of a shell. To the far left is what appears to be a head of Christ (ibid). 1. (South chancel) C13 trefoil-headed and roll-moulded..
2. (South aisle) C14 with a continuous hollow chamfer, inserted at the same time as the east window. Pulpit: Assembled from early C17 panels, probably in the C19. 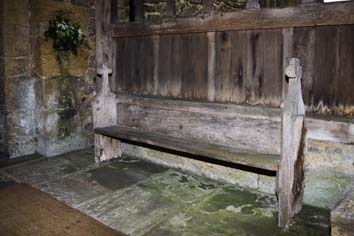 Stoup: (North porch) Plain, but possibly C15.